The Nushagak River supports one of the largest Chinook salmon runs in Alaska. The primary tool fishery managers use to assess the run is a sonar project that was intended to primarily estimate the passage of sockeye salmon. 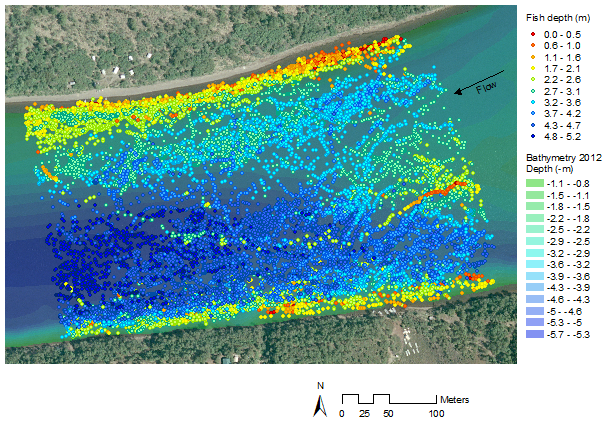 The sonar samples a nearshore and an offshore stratum along each side of the river, leaving a large area in the middle of the river unsampled. Gillnets are drifted through each sonar stratum and the daily species ratio of captured fish is used to apportion the sonar estimates to species. There has been concern that differences in migration behavior may introduce a species bias in this method. To address this concern the Alaska Department of Fish and Game conducted an acoustic tag study to determine the spatial distribution of Chinook salmon migrating past the sonar site. Over the course of this 3-year study more than 500 Chinook salmon, captured downstream of the sonar site, were tagged with acoustic transmitters. These transmitters were then detected by an array of hydrophones as the fish migrated past the sonar site. The tagged fish positions (triangulated from the known locations of the hydrophones) fed into several types of spatial analyses, including direction of travel and the cross-river distribution as a function of travel direction. We used ArcGIS and its Spatial Analyst extension to produce, for example, a quantitative map of the spatial distribution of tagged fish moving upstream. The map shows two interesting results. One is that the tagged Chinook salmon appeared to travel along well defined lanes. And secondly, even though Chinook salmon may not be quite as bank oriented as sockeye salmon, the tagged Chinook salmon in this study still showed a clear preference for travelling along shore, as opposed to offshore. Based on these and other results of the tagging study a correction factor was devised that accounts for off-shore passage and multiple trips made by individual fish to convert apportioned sonar counts to an estimate of net upstream passage of Chinook salmon. Travel lanes of tagged Chinook salmon moving upstream through the study area. 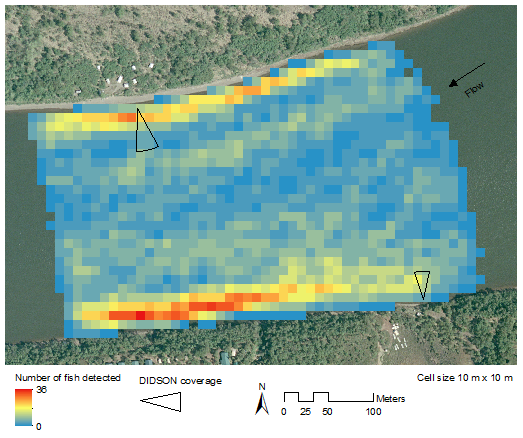 The cell values represent the number of tagged Chinook salmon whose track crossed the given cell. GIS analysis also proved to be useful for checking the integrity of the tag data. The map below shows the detections of Chinook salmon moving upstream, colored by depth information provided by a pressure sensor in their acoustic tag. It is well understood that migrating salmon tend to swim along the river bottom to reduce the amount of energy required to move upstream. The good spatial alignment of the pressure sensor data with the local bathymetry indicated that the overall spatial integrity of the data was good. Depth of tagged Chinook salmon moving upstream through the study area. © Copyright 2016. All Rights Reserved. Aquacoustics, Inc.